Discussion in 'Game' started by VGamer, Apr 27, 2014. Nitron_ZX and World 1-1 like this. @Mario-Fan thanks for clarifying that, I guess I thought the same as @TiagoDu , I was like "why the hell they are working hard to write a private message? That makes no sense." Develon and Faruga like this. LOL. The old "Man eating chicken" problem. Thanks for clarification. Nitron_ZX, Mitewing, Omicron and 1 other person like this. So what are they working hard on? What a perfect conclusion. No, he's not new here, and no, it isn't obvious what they're working on. Super Action Squad is dead (to be revived in the future), so it could be keeping the site up, fending off lawyers, trying to earn money the boring way or even making a new awesome thing. imgdat maintains the site. AFAIK, Jay does very little in this matter, mostly when it takes root access. People who pledged to the Kickstarter don't have enormous amounts of money worth battling in the justice system over a few hundred dollars worth of a pledge. They have been doing this ever since always. even making a new awesome thing. My point was Jay usually doesn't outright say what he's working on until he has a formal announcement about it. If they are working on SMBC then I have some guesses. Kirby as a playable character. Super Mario World Crossover (Super unlikely). Physics and enemies and power-ups from other games in SMBC. I know its unlikely, and they are probably just busy. But what fun is that? Actually, all I would like to see is additional character and map skins, a few gameplay tweaks for each character to make them more complete, and a few skins turned into separate characters. Brand new characters aren't necessary as there's still so much they already have they can work with. I want Toad and Peach to have their original jumps and running speeds and abilities. Actually, he would be a cool skin to add, but not for Mega Man. Samus or Bill would work better. 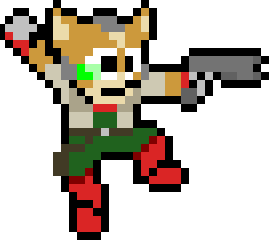 Someone made a Fox and a Falco skin for Samus. They're pretty nice, but the one thing that bothers me about them is... they don't have tails. I saw them on the Wiki. And yes, they need their tails added! If we get Raccoon Mario added to the game, then we should add a Tails skin to it. I wish that they would add this little guy to the game or as a skin for mega man.